We hope that you do not suffer from a fear of flying. On a 120-minute trip we will fly over new territory and discover valuable ideas for your journey into the digital future of your company. New methods are providing organisations with the tools they need to focus on the requirements of their customers. You will probably experience some turbulences on your way to digital transformation, but our competent and skilled crew will be by your side. Do you already have a new, digital business model in place that focuses uncompromisingly on the requirements of your end customers? Do you regard “digital transformation” as an opportunity or as a threat? Are your customers at the centre of your attention? Have you already gained experience with innovative methods? And what is the concrete answer to these developments for your company? Our exclusive Business Breakfast Roadshow taking place in May 2019 with stops in Bern, Zurich, Basel, St. Gallen, Lucerne, Lausanne and Geneva will give important impulses in three short presentations and also leave enough time to network with representatives from the Swiss private sector and public administration. "Digitale Transformation and customer journey"
Our flight into the world of digital transformation will start with the crossing of a complex motorway junction, an analogy to the fact that digital change can lead into many directions. Buzzwords often give rise to misunderstandings and the risk that their implementation – set apart as flagship projects – will not fit into the existing landscape as well as it could. Fabasoft is using innovative methods such as design thinking to master these challenges and tackle the necessary change process with a practical orientation and broad acceptance. This method supports our customers in finding a solution that is based on the real requirements of their internal as well as external stakeholders. We are also using the UX design method that allows to integrate the requirements of all company levels into a user-friendly solution which will consequently achieve higher acceptance with the end users. Digital transformation, design thinking and UX design are inextricably linked at Fabasoft. 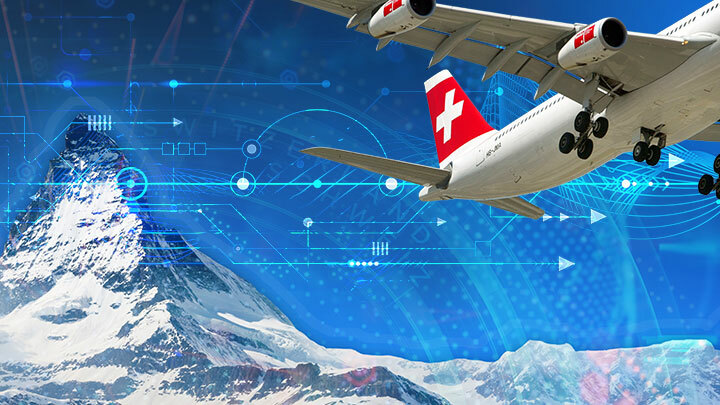 In the course of our flight with three destinations we will take a close look at these three topics since they are essential to achieving the objectives on the complex way of digital transformation. "Design thinking - Methods and tools for innovation"
With design thinking, complex problems can be solved in a creative way in co-creation and with the involvement of all company levels. Many companies have already implemented this method. But what exactly is “design thinking”? How can we achieve the desired “customer centricity”? Is it yet another short-lived hype term or can this innovative method really accomplish any measurable benefit? On our flight we will discover possible answers to these questions together. The concept of user experience design (UX design) serves as a method to create products and services which aim at shaping the customer experience as optimally as possible. UX design puts the user and the user experience into focus – ranging from acquisition to product integration. In the course of our flight we will explore the current and increasingly urgent challenge of putting the emphasis on the user, also and especially on the way to digital transformation. The Fabasoft Business Breakfast flight is taking place in a small and exclusive setting. The selected flight altitude is ideal to keep the path and the target in sight. Benefit from the know-how of the Fabasoft crew. I hereby agree that the personal data I have entered above may be processed by Fabasoft for the purpose of handling my registration for Fabasoft events. I can withdraw this consent at any time by sending an email to office@fabasoft.com. The data processed up until the time of my withdrawal of consent remains legal.